As the school year hits the home stretch, students are walking out, sitting-in and organizing—against austerity hawks, toxic campus climates and wanton discrimination. E-mail questions, tips or proposals to studentmovement@thenation.com. For earlier dispatches, check out posts from January 18, February 1, February 15, March 1, March 15, April 2, April 15 and April 26. The North Carolina General Assembly is passing an avalanche of regressive policies, including deep cuts to unemployment insurance and public education, restrictions to Medicaid eligibility, racist voter suppression laws and raising taxes on 900,000 working North Carolinians while cutting taxes for the richest twenty-three families. Now, students are standing in resistance with people from across the state. 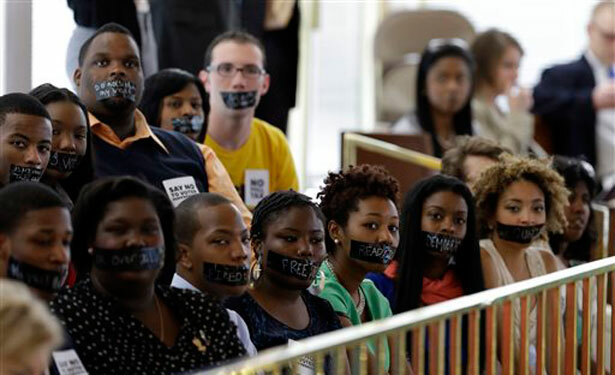 On April 29, seventeen people were arrested for blocking the doors to the State Senate, including two students from NC Student Power Union. On May Day, 350 students from ten different campuses marched to the General Assembly, and five students were arrested for trying to enter the building. On May 6, another group of thirty-one people were arrested—including grandmothers, students, professors and preachers. Mobilizations are planned each Monday until the end of the legislative session. On April 22, 16-year-old Kiera Wilmot was arrested at her Polk County high school for conducting an explosive science experiment. The teen, who has no criminal history and maintained good grades, suddenly found herself trapped in Florida’s insidious school-to-prison pipeline, which has continually funneled mostly youth of color out of Florida’s schools and into the criminal justice system. Polk County Superintendent John Stewart has made the decision to place Kiera in an “alternative school” as he considers expulsion proceedings. Dream Defenders finds these actions by Superintendent Stewart reprehensible. We demand that Stewart drop all expulsion proceedings against Kiera Wilmot and allow her to return to her enrollment at Bartow High School. We are calling on concerned individuals to sign this petition, organizations in solidarity to sign this organizational petition and for everyone to contact Polk County Superintendent directly at 863-534-0521 to let him know we will not stand for this in Kiera’s case—or for this kind of treatment for youth in any case. RealTalk Dartmouth is a growing movement of students, faculty, alumni and public supporters that seek to contest a deeply entrenched culture of hate that affects the lives of Dartmouth College students. On April 19, the first of several direct student actions took place to make visible the foundation of our mission—Dartmouth has a problem—at the annual show put on for prospective students. Following the protests, the College announced a day of cancelled classes for students to partake in small group meetings and discuss the campus climate—which many students, faculty, alumni and RealTalk members felt was simply an image-saving move. This is only the most recent and highly publicized example of student dissent. Every year, the college stands witness to sexual assault, racism, homophobia, transphobia and elitism enacted by students who, in turn, face little to no disciplinary action. Through nonviolent protest, RealTalk signals to the administration and to the community that we’ll no longer tolerate this vicious cycle of systematic dehumanization. The Philadelphia Student Union is a founding member of the Philly Coalition Advocating for Public Schools. We've joined together with teachers, parents and community members to advocate for keeping our schools open and making them better. This year, the School Reform Commission voted to close twenty-three schools in Philadelphia. At the meeting where they voted, nineteen people, including our Executive Director, Hiram, and a PSU alum, Azeem, were arrested. This is just the first phase of a five-year plan to close schools in Philadelphia. Right now, we’re preparing to fight back against the next round of school closures; working with students and staff in schools to ease the transitions when students whose schools closed move into our schools; and, as part of the Campaign for Nonviolent Schools, working with principals and the SRC to get restorative practices in our schools. On May 9, students from across the city walked out and rallied at City Hall to protest the district’s deep budget cuts—which include arts, sports, counselors, nurses and much more. On May 2 at Chicago’s Lincoln Park High School, there were many whispers about “the walkout,” how no one was going to show up and how those who did show up would get suspended. When the bell rang at the end of second period, hundreds of students walked outside, and whispers subsided to cheers of teacher-student solidarity. Students were protesting the firing of eight teachers as part of the school's recent implementation of a “Wall-to-Wall” International Baccalaureate program. The walkout started as a series of rumors the afternoon before, a Facebook event was made that night and the walkout happened just twelve hours later. The students staged a peaceful protest, and were not punished. The Providence Student Union has been fighting for months against Rhode Island’s adoption of the New England Common Assessment Program, or NECAP test, as a make-or-break graduation requirement. Students have held creative demonstrations such as a zombie protest and an event where successful adults took (and mostly failed) the test themselves. On April 30, the Providence Student Union staged its own State of the Student Address outside the Rhode Island Commissioner of Education's annual State of Education speech, where students offered their own list of recommendations for transforming their schools. After the event, a group of PSU leaders marched into the State House and delivered their policy recommendations to the Commissioner of Education, the Chair of theBoard of Education, the Senate President and the Speaker of the House. In Mandeville, Louisiana, people are angry about the state’s move to hand confidential student information to inBloom, a private data management company. In April, a classmate and I attended an emergency meeting in Baton Rouge on student data sharing. In my testimony I asked, "How would you feel if your personal belongings were stolen and sold to the highest bidder?" We were bullied by Superintendent John White for questioning his motives in selling our information to anyone who wants it without our consent. A few of us will be missing final exams to speak up again at the next board meeting—and we'll continue to educate our peers. Project 3 was started by students at New Jersey’s Rowan University who are frustrated with the extreme lack of inclusiveness on campus. Self-segregation is highly prevalent, and students do not feel the university is committed to creating more understanding of historically marginalized communities. Students are proposing the creation of a Multicultural, LGBTQ and Women's Center to provide safe spaces for these communities. A one-person Office of Multicultural Affairs on a campus of over 12,000 students is indicative of our university’s insufficient commitment to inclusion. Students have not been involved nor asked to help create any new initiatives that would establish permanent change. Project 3 looks forward to bringing all interested parties together to establish a new center here. 9. When Will Pomona Workers Get a Break? On April 30, dining hall workers at Pomona College in California voted 57-26 to form a union with UNITE HERE Local 11. This marked the final victory for workers after more than three years of fighting for respect in their workplace and a voice within the college community. Since this campaign first went public in Spring 2010, workers have spoken out about undervalued work, injuries in the workplace and unjust firings. In December 2011, students, alumni, faculty and clergy stood in solidarity with workers after seventeen people were fired following a document check of the college's employees. After a strong push from the community, the college finally agreed to rehire workers if they returned to the college with a work authorization permit. Now that the union has been certified, this growing community will support workers as the negotiations for a contract begin. 10. What Would Bucky Badger Do? After organizing for dignity in the workplace in response to unsafe working conditions and discrimination, 105 workers from Palermo Villa, Inc., were fired in May 2012. Students, faculty and staff at the University of Wisconsin-Madison have been pressuring Chancellor David Ward to cut the $217,000 contract with Palermo that allows the company to brand its pizza as "the official pizza of Bucky Badger." The campaign escalated from caroling outside the Chancellor's house, a 10,000 signature petition and letter deliveries to a full-blown sit-in at the Chancellor's office on April 29. Twelve students were arrested and subsequently released. Now, Chancellor Ward is calling on the National Labor Relations Board, Palermo and the developing Palermo's Workers Union to rehire eleven workers who were fired illegally—but they still haven't been rehired.